You can conjure the picture in your mind if you try. The end of World War II. Parade in the street. 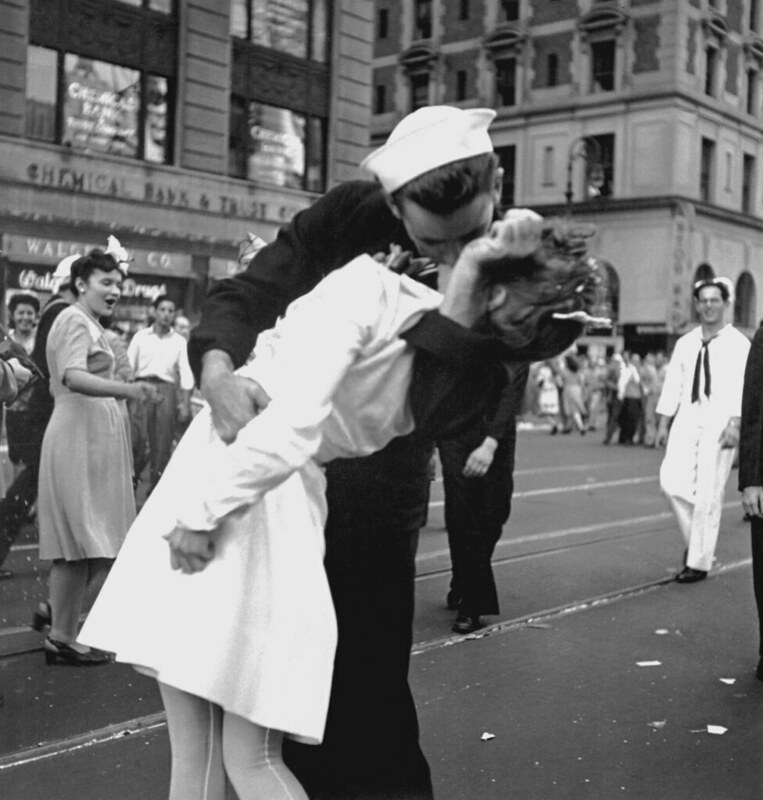 A young sailor and a young nurse in an embrace, kissing. Around them, the parade, the confetti falling, the sheer celebratory joy of the crowd. It’s a picture that has become iconic. You’ve seen it on postcards and walls. In San Diego they made a statue of it. The idea of it is so romantic; this is America. A young sailor in jubilation, a young nurse, eager to celebrate beside him. The two of them, strangers, and yet, intimates in that one moment, captured by one sly photographer. I learned to watch myself, made friends with my own image, a constant companion. I saw her (me) while I was walking across the room to shake hands and receive my diplomas (all three). I saw her (me) at my father’s funeral, sitting beside my mother, weeping beautifully into a tissue. My lesson was to embody both: the photographer and the model. I noticed what hypothetical men would notice. I kept a running list. It exhausted me, though I understood the list was of crucial importance to my success. I remember the way my face crumpled in the mirror, then turned red, then squinty. Then my eyes would shut and the noises could choke out of my throat and at last, the blessed tears. I used to make myself cry so I could watch myself, in the mirror. Five years old and I had already realized that I needed to know. Part of it was my obsession with being an actress. I thought I should be able to weep on command. I could conjure the tears when I worked hard enough: pictured dead kittens, my parents gone. Pictured abandonment and death. Death was less useful. Abandonment, though? That one stung me deep. Ugly cry was not a phrase I knew as a child, but I had watched myself in the mirror enough times to know that it was a phenomenon. The times I was really upset, usually with my mother, I lost control of my body, as the sobs echoed up from some deep part of my diaphragm. The spastic feeling when I wouldn’t be able to breathe. Hyperventilation, but I didn’t know that word. I knew the story of it in my body, when the feelings got big and the air ran out. I knew how to conjure pretty tears, but this was something else, something powerful. Something beyond the control of my conscious mind. I recorded it with my body, I watched myself in the mirror. What was the difference between weeping and sobbing? I turned my lens upon myself. I needed to know so I could control. You can conjure the image in your mind if you try. It’s Times Square, V-J Day. Confetti is falling and a jubilant crowd is walking in the middle of the road. Center frame, a young sailor in navy and a young nurse in white are locked in an embrace. Her hand curled against his chest in a fist. His arm locked around her head. Isn’t that what you remember? The photograph is called “Kissing the War Goodbye.” Isn’t that what you see? This is America. What if there hadn’t been a photographer? Or what if he had pointed his lens a different direction, missing the shot? The kissers would have faded into their own memories. How did the photographer know to look there, and when? Age thirty-three, after the birth of my first child, I tried to escape my own lens. Nothing in my closet fit, so I threw most of it out, keeping only a few beautiful dresses that it pained me to let go of, and packing them away in a plastic tub. My size 4/6 wardrobe no longer taunted me from the closet. What was left was an assortment of yoga pants, nursing tanks, maternity clothes, and a few oversized blouses passed on to me by a well-meaning friend. For the first time in my adult life, I wanted to cocoon myself. In the light of a moon, a little egg lay on a leaf. And out of the egg came a tiny, very hungry caterpillar. He ate a lot after he came out. Part of the fun of the book is the eating of things. One delicious apple. Two ripe pears. And my favorite day, Saturday, when he ate one ice cream cone, one piece of chocolate cake, one sausage, one cupcake, and on and on and on. And after that he wasn’t hungry anymore. He was also not little anymore. He ate his way into big fatness. He ate his way into the future, which was the shape of a winged thing. Angelic? I don’t know. Before he could get there, he had to build a house. I imagined the house—the one Eric Carle drew was far too brown and easy. I imagine a house made of spit and vehemence. The big fat caterpillar built his chrysalis out of his vomit and his own sick rage. He engorged himself so that he could purge the excess out into fiber and spit, like paste. Sticking the cocoon around himself like paper mache on a balloon. It did not occur to me then that his purpose was self-obliteration. I did not know the word for what it meant to liquefy his form and lose himself in a barrel of spit up, paper-thin walls that smelled like old pennies. Does he smell his own transformation, or does he only know terror that his body, his big fat strong solid friendly known body, was unbecoming? And then becoming something other. Alien. In 1924, the Hawthorne Works—an electric company outside of Chicago—commissioned a productivity study. Their hypothesis was that the lighting levels in the workplace would affect productivity. At first, it appeared that productivity was affected by the changing levels of light. Later, it was determined that the attention being paid by the researchers was the thing that made the workers productive. Being observed had an effect. This is true, even at quantum levels. In a 1998 study, researchers at the Weizmann Institute of Science conducted a highly controlled experiment demonstrating how a beam of electrons is affected by the act of being observed. The experiment revealed that the greater the amount of “watching,” the greater the observer’s influence on what actually takes place. In other words, when we watch something, we change it by the mere act of looking. We all have a lens—a lens that defines not just what we see, but, consequently, who we are. Maybe like a comet, shooting through the atmosphere, breaking into smaller and smaller space rocks. Maybe that is the first way I encountered what it meant to be obliterated. I didn’t know then that obliteration happens all the time. I didn’t know my history book was an obliteration of stories. I didn’t know my English syllabi at my very feminist, all-women’s college was also an obliteration of stories. That the things I learned were also indices of the things I would never learn. In law school, I never wondered why we trusted the men in the coats and powdered wigs to be correct about the way to see the world, the things that were important, the height and breadth of objectivism. It did not occur to me until recently, when I obnoxiously law-splained the “drafters’ intent” of a recreational marijuana statute to a Black woman. They didn’t mean to craft the law to exclude people of color, I explained, it’s just an unintended consequence of not allowing felons to own recreational marijuana businesses. So sure of myself, I told her this was just objectively the best way to write it. They crafted it to obliterate, but not with intent. It’s almost worse when someone annihilates you without intent. The list of obliterated stories is too long to include. But for a moment, remember what you were told about Christopher Columbus, pilgrims, slavery, Thomas Jefferson, Confederate statues, freedom, voting rights, civil rights, the prison system, the justice system. Has your lens cracked yet? Do these narratives fill with plot holes before your eyes? This is America. For thirty years, the sailor and nurse in the photograph were unknown. In the excitement of the parade, the photographer hadn’t had time to get the names of the subjects. In 1980, the young man, George Mendonsa, came forward. The young woman, he said, was a stranger. Where was she? Who was she? The man didn’t know. After sixty years, Greta Zimmer Friedman identified herself. As to why it had taken her so long, she said she was embarrassed. Once you hear the truth, the image unwinds before your eyes. His left arm is headlocking her. His right arm has a tight grip on her waist. Her chin is tucked back, pulling away. Her hand, in one of the less iconic frames, balled into a first against his chest. Her body says no. His body says mine. Chrysalis: the chamber of self-annihilation and transformation. The crackly paper-mummified exterior that keeps what’s falling apart within. The stew and the cesspool. Imaginal goo reforming into something strange. With wings instead of soft feet, with a death wish and a long flight ahead. The butterflies of my past imagination were always sparkly drag queens. Once upon a time, trapped in their caterpillar bodies, earthbound. But now, now, now in their glittery shoes and their fierce makeup, now they are queens. I want to eat myself gigantic like the caterpillar. But I don’t want to vomit it up into a cocoon, no. I just want to grow larger and more terrible, until the faces of men go ashen at the sight of me. I want to embody their nightmares: a woman unhinged from their beauty standards. A monster with a fist large enough to hold them back. Men act and women appear. Men look at women. Women watch themselves being looked at. This determines not only most relations between men and women but also the relation of women to themselves. The surveyor of woman in herself is male: the surveyed female. Thus she turns herself into an object―and most particularly an object of vision: a sight. I looked in the mirror, and I saw fat. A mountain of fat growing on my belly. Two thighs the size of logs, unshapely. An ugly round face without a smile. I signed up for Weight Watchers. I lost some weight, but I still saw fat. I wasn’t the long, lean, graceful model-me of my imagination. I lost more weight. I was never able to see myself as other people saw me. Sure, sometimes when a well-meaning friend would gush, “You look great,” I felt a warm sense of accomplishment. It was a lot of work to lose fifty pounds, sixty pounds. Though eventually, over and over again, I would stop losing, and my body would soften again. When that happened, I would look at the pictures of the “old” me; sometimes just months earlier. She was so skinny! Why didn’t she see it? Why wasn’t she happy with that flatter belly, those narrower arms and thighs? Why didn’t she know that she looked good? I had listened to my mother do this all of my life. Looking back at older photographs, able to appreciate from a distance what she couldn’t see then: she was beautiful. She was beautiful. But she never saw it present tense. Beauty was always an object in the past, an accomplishment she’d appreciate once it was gone. I did it, too. It kept my head trained backwards down the tracks of my life, or pinned my happiness on some point in the distance: a magic weight, where I would finally feel beautiful. But when I arrived at that weight, there was always another number in my mind that was better, and as a decade passed, I found that I both chased the past and the future versions of myself, but never found the joy of being where I was, as I was, good enough now. I could not see where I was. I could not see myself. Obliterate; a transitive verb. To remove from recognition, from memory, from existence. To make undecipherable by obscuring or wearing away. From the latin, oblitteratus, which meant to literally blot out, or remove something from memory. What have we removed from memory, from existence? Whose stories were made indecipherable? Where have we blotted out the meaning? To change we have to annihilate. We have to be willing to melt down, re-form, break apart, and reimagine ourselves, like the caterpillar. Like the caterpillar, we might not even have a choice. The photographer? His name was Alfred Eisenstadt—a German Jewish emigre naturalized in 1935. He’d seen the sailor coming, running through the crowd, grabbing unknown, unsuspecting women and kissing them. The photographer ran ahead to get the shot. It was calculated, see? He knew the sailor would grab some strange young woman any minute now and he would capture it with a click of his Leica. The photographer didn’t know the photograph would be the masterpiece of his career, but he knew he’d get a shot. A good shot. A shot worth the discomfort of however many women he allowed to be assaulted. The nurse was the perfect object, according to the photographer, because her white uniform contrasted the sailor’s navy blues. If the sailor had been in whites, the photograph wouldn’t work. If the nurse had been in dark clothes, it also wouldn’t work. She was the perfect object. Can you see it now? Is the image different in your mind yet? A thing you can’t unsee. A headlock. A tucked chin. A story breathing underneath the story. This is America. This has always been America.